We are working with best-in-class teams and providers, integrating existing financial services with emerging networks, specifically designed to empower under-served communities. At Maya we believe EVERYONE should be able to participate and thrive in the economy. 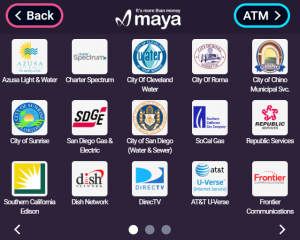 Maya is a social initiative technology company that provides financial services infrastructure for under-served communities in the U.S and abroad. One third of the U.S. and over 2.5 billion people worldwide rely on alternative financial services rather than traditional banking institutions. Maya is the new standard for alternative financial services. Specifically, we specialize in self-service payment terminals (ATMs), Point of Sales (POS) systems and a mobile app. Our customers are able to access a diverse suite of digital services including: Bill Payments, Cross Border Money Transfers, Mobile Top Ups, Gift cards, cash out (ATM) and other payments and prepaid products. Maya machines provide store with a self serve solution for proving financial services to cash-based communities. Our machines generate revenues, in addition to bringing new customers to your store. Maya provides the most advanced KIOSK/ATM for financial transactions. Using Maya kiosks customers can pay bills, transfer money internationally, perform traditional ATM functionality and in the future they will be able to buy crypto currency as Bitcoin.